Strictly Come Dancing may be over for another year, but we all want to keep dancing. When we talk of swing, we immediately think of swing music, swing bands or the swing era. But what about the dances that accompany swing? After all, the ability of the music to naturally want to get you on your feet and dance is one of the most appealing things about swing. 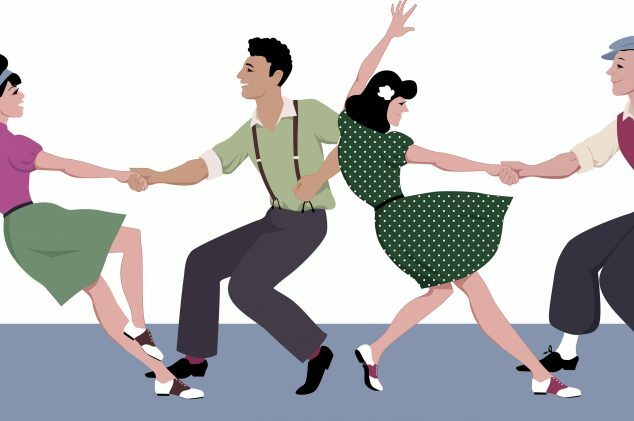 Here is our guide to two of the great swing dances. The Lindy Hop originated from Harlem, New York City in the 1920s and 1930s. It is a classic partner swing dance. It borrows heavily from the Rhythm Tap and the Charleston. The Lindy Hop features both 6 and 8 count steps. The beauty of the Lindy Hop is its versatility. It can be quite wild but it can be danced in a more cool and sophisticated style too. Therefore, it can be adapted to suit the mood of the music – and the dancers! The birth of Rock ‘n’ Roll all but put paid to the original Lindy Hop, but it’s enjoyed a remarkable resurgence in recent years. The story behind the name of this swing dance is an interesting one. Legend has it that during a 1930s dance marathon, a journalist asked a dancer what the name of the dance he was doing was. The dancer, George ‘Shorty’ Snowden answered, ‘I’m doing the Lindy Hop’ – a reference to Charles Lindbergh’s solo Atlantic flight and the newspaper headline of the day ‘Lindy Hops the Atlantic’. The name ‘Lindy Hop’ just stuck! It’s fitting that with one major dance emerging from the East Coast that the other should hail from the West Coast. The Balboa swing dance takes its name from the Balboa Peninsula on America’s Pacific coast. It is a 8 count dance that can be danced with a partner in a closed position – known as ‘Pure Balboa’. Dancers can also break away to perform more flamboyantly. This is known as Bal-Swing. It’s usual for modern Balboa dancers to incorporate elements of Pure Balboa and Bal-Swing into a single routine. Although the Balboa is perfect for fast-tempo music, it is equally suited to slower tunes as well. Of course, swing dances are nothing without some swing music to dance to! Silk Street Swing are available for hire for any event. They are guaranteed to get guests up on the dancefloor all night. For other Jazz & Swing Band options, check out Silk Street.